Britain’s best loved range cooker brand has developed a collection of ovens that are every bit as impressive as the cookers they're renowned for. For those on the lookout for a separate oven that slots more easily into most kitchens, Rangemaster ovens showcase the same level of craftsmanship and intelligent design we've come to expect from their range cookers. Take the RMB7248BL/SS Electric Built-under Double Oven, a multifunctional electric oven that offers exceptional versatility and an array of useful functions that will enhance your everyday cooking. Whether you're grilling, baking or roasting, you can select the best cooking method for your meal with the multiple oven functions. Choose from options including a browning function, a full-width fanned grill, and defrost heating. Whatever you’re cooking this comprehensively equipped Rangemester oven has a function that will help you achieve delicious results. Because the RMB7248BL/SS incorporates two ovens you’ll be able to cook multiple ingredients at the same time, helping you bring ambitious meals together more easily. Even more cooking convenience come courtesy of programmable functionality that allows you to set the oven to come on at a time that’s convenient for you. You’ll be able to plan your meal preparations around your lifestyle - come home from work to a hot meal, or set the timer and get on with other tasks without worrying that your meal will cook for too long. 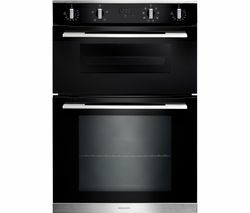 And if you find cleaning your oven can be a bit of chore – who doesn’t – you’ll be glad to learn that Rangemaster ovens feature easy clean enamel interiors which prevent spills and mess from burning onto the inside of your oven, so all you'll have to do is wipe away any debris with a damp cloth. Our complete collection of Rangemaster ovens features built-in and built under single or double ovens, so you should have no trouble finding a model that perfectly matches your kitchen and lifestyle. Explore our oven collection to browse the latest Neff ovens and view all Baumatic ovens.